Submitting a sitemap to Google is the first thing that is to be done after starting a blog at Blogger .It gives an idea for the crawler , about all inner pages and archives of your site. There are no plugins for creating a Blogger sitemap .So we will have to use the default atom feed for submitting a Blogger sitemap to Google webmaster tools account . Now in the dashboard , you will be asked to enter your site as shown below. Clicking add site takes you to next step for verifying your Blogger blog. Select add meta tag from the combo box and copy the resulting meta tag code to edit your Blogger template . To submit a Blogger sitemap to Google , they need you to verify that you are the blog owner. Save the template and click verify button. 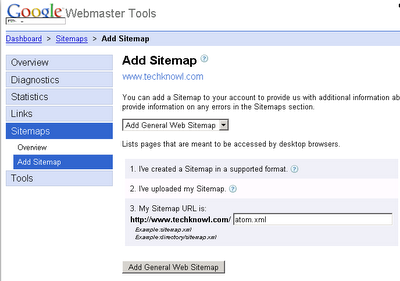 From the Sitemaps tab on the left , select add site map and choose “Add general web sitemap”. Now add Blogger sitemap as your atom feed (atom.xml) and complete the entire procedure .